Our room was in a small self-contained cottage in the family compound – a rambling expanse of tropical trees and plants, a few half-hearted vegetable beds and several fenced enclosures containing chickens, rabbits and pigs. One day we awoke to steady rain, which persisted through out the morning, keeping us captive in our room. But from our window we could see smoke from an outdoor fire, and even with the door shut we could hear lively Cuban music. We ventured out to see what was going on. The smoke and music were coming from behind another house in the compound. As we walked around it, we came upon a man who looked like a modern-day Che Guevara – young, ruggedly handsome, with a swarthy complexion, a charming white smile, and bright intelligent eyes. He was wearing yellow rubber boots, a grimy canvas shirt, and a smoke-blackened straw hat. ‘Che’ was squatting by a tidy fire, using what looked like a charred canoe paddle to stir the contents of a big tin pot, fishing out sizzling morsels of meat and dropping them onto a plate. When he saw us he stood up, and welcomed us in typical Cuban fashion, holding out the plate with its fresh-cooked bits of pork. Another man, considerably older and stockier than ‘Che,’ was cutting up slabs of pork fat into thin strips and tossing them into a bowl. He was using a knife that looked like it might have been made in the Middle Ages – half machete, half cheap Chinese meat cleaver – and hacking away with great gusto, singing and laughing as he did so. He was wearing the greasiest, grungiest, frayed and torn pants and shirt imaginable – we guessed that it was him that had caught the pig, and held it down in the mud while ‘Che’ delivered the coup-de-grace. There was also a young girl, perhaps in her early teens, sitting off to one side, hugging her knees to her chest and observing us all, giggling at the pig-catcher's jokes and antics. ‘Che’ introduced her as his step-daughter, and tried to persuade her to practice her English with us, but she was too shy. When the water was boiling, the pig-catcher dumped the bowlful of pig fat into the pot. The water frothed up, bubbling almost over the top. ‘Che’ kept stirring it round with his canoe paddle. 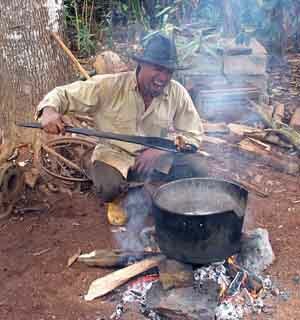 He told us that once the water stopped foaming, the “chicharones,” or pig fat cracklings, would be done. Chicharones are hugely popular in Cuba, partly because they're so cheap that almost everyone can afford them, and partly because there's precious little other protein or fat available. As we chatted with ‘Che’ over rum and chicharones, we found out that he had learned his English while working in Jamaica, and his French, which he said was better, while working in Haiti. When we asked him what kind of work he was doing there he told us he was a doctor – an obstetrician/gynecologist. So he shared not only his appearance with Che, but also his vocation. Cuban doctors are required to repay the government for the cost of their education by going to work in other countries. At the moment, most of them are going to Venezuela which pays – the Cuban government, not the doctor – in oil. 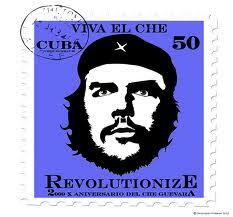 ‘Che,’ having done his obligatory two or three years of 'foreign service,' is now working in Cuba. As a specialist he makes among the highest wages in the country - $30 to $35 a month. Considering that a litre of cooking oil costs anywhere from $3 to $5, his wages are hopelessly inadequate, in terms of feeding, clothing and housing himself and his family. I was also curious about the rate of epidural use for labour in Cuba, as it seems to be on a steady rise in both the US. and Canada. ‘Che’ estimated the rate in Cuba as somewhat under 20%. Epidurals are used, he said, primarily for women who have “a low tolerance for pain.” Che then did an amusing pantomime of a woman in the early stages of labour, contorting his face in grimaces and crying out piteously for help. He appeared most unsympathetic, but surprised me by saying he thought epidurals should be more widely used, as he personally likes the idea that women can have pain-free labours. He was not aware of the risks or disbenefits of epidural anaesthesia, and seemed inclined to discount them as of less significance than the pain relief they provided to women in labour. To be fair, ‘Che's’ ability to research the risks and benefits of epidural anaesthesia, or any other obstetric or gynecological issues, is severely limited. As an obstetrician, ‘Che’ is permitted, by the Cuban government, only a few hours a week of internet access, and even then his access is limited to sites approved by the Cuban government. Like all medical practitioners in Cuba, ‘Che’ relies heavily on the accounts of colleagues who have been to conferences or who have received information from others. We finished our ‘shop talk’ with the subject of obesity. I asked ‘Che’ if he could explain why I have seen so many more fat, obese, and morbidly obese people in Cuba than I had seen when we were here 3 and 4 years ago. ‘Che’ felt that this was a result of the recent easing of the ‘Special Period.’ The ‘Special Period’ was instituted by the Cuban government shortly after the collapse of the Soviet Union, in the early 1990’s. Cuba had been heavily dependent on the Soviet Union, so it’s collapse was devastating. Food shortages were severe, and the government was forced to institute a rationing system, which is still in use. According to ‘Che,’ although the ‘Special Period’ was still not over, it is now possible for Cubans with to buy food, whereas before, even those with money couldn’t buy food – there just wasn’t any to buy. So being fat, he mused, has become a symbol that one is doing well, and has enough money to buy extra food. Fat is something to flaunt. On a more serious note, ‘Che’ also reminded me that Cuban people, given how difficult their lives are, do not have the time or the luxury to consider what is best for them, in terms of diet. They have also not been educated about diet and nutrition, although the government is recently trying to encourage Cubans to grow and eat more vegetables. He let out a short laugh, but then his expression changed completely. He turned towards me and I saw that his eyes, which up until this point had been lively and sparkling, had become more serious, wistful. Just before we left, I remembered that we had a CD of Cuban music made by a group of Cubans now living in Canada, called “Impacto.” I thought our friends might like it, so I fetched it from our little casa. They put it on right away, and were delighted not just with the music, which they said was 'great new Cuban music,' but with the quality of the recording. “And these are Canadian musicians?” Che asked. “Cubans, now living in Canada,” I explained. Cubans have a hard time coming to terms with 'the ones that got away.' Although are officially labeled deserters or ‘worms,’ there’s a strong undercurrent of envy when discussing them. ‘Che’ reacted to the news in a classically Cuban way: he picked up his step-daughter and danced about with her in his arms. It was a truly charming sight – he so radiant with youthful energy, and just a little rum, and she so light and delicate in his embrace, and so clearly delighted to be there. About the author: Ruby Weldon is a nom-de-plume, used to protect the identity of Ruby’s many Cuban friends, who might face unpleasant consequences if Cuban authorities think that they have supplied Ruby with information for her articles. Other articles about Cuba by Ruby may be found at www.rubyweldon.blogspot.com and at www.matadortravel.com/traveler/ruby-weldon. She has no phone and no permanent address, as she is currently traveling.